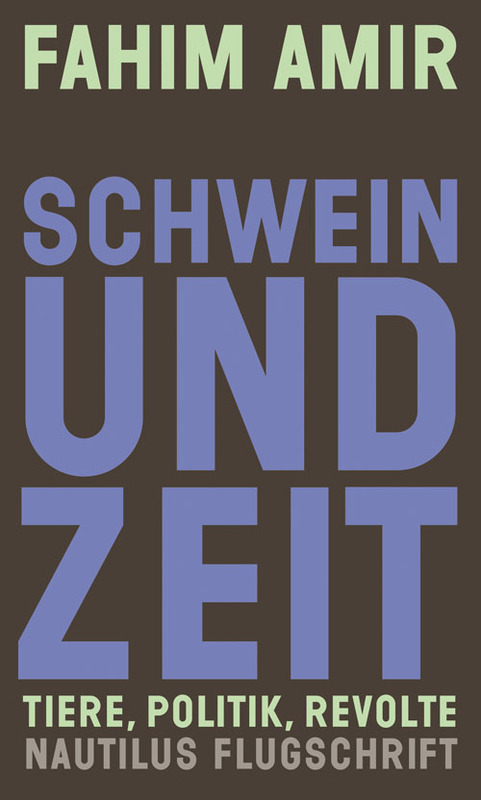 Fahim Amir’s »Schwein und Zeit« (»Being and Swine«) selected for the top ten best non-fiction books of January 2019 (Sachbuch-Bestenliste). After having received the Austrian Karl-Marx-Award even before publication, Amir’s book is now confirmed by a jury of journalists and booksellers as one of the best non-fiction books and praised with hymnic reviews in Neue Zürcher Zeitung and Deutschlandfunk Kultur. English translation samples of two chapters are available, please feel free to order! In most cases, criticizing environmental damage by capitalism or industrial livestock breeding is based on a conservative idea of an »untouched nature«. But Amir goes the other way, of politics instead of ethics: If you look for bourgeois DIY-advice on urban beekeeping, this book will deeply disappoint you. Instead, Amir examines the important role of headstrong and unruly pigs in the development of modern factories and reports on the »swinish multitude’s« insurrection – humans and non-humans together – that repeatedly shocked New York a century ago. Being and Swine is an antidote to any sad cultural pessimism that can only ever see animals as »total victims« of human hegemony. Amir, instead, shows how to see animal history from a perspective of struggle: If animals can be seen as perpetrators, offenders, public enemies and resistance heroes, the slogan »no pity, but solidarity« becomes convincing. Cigarettes, estrogens and bird’s nests: Birds drinking water from London’s sewage will get veritably doped by the estrogen it contains – which makes them sing far better and find more partners for procreation than their »uncontaminated« fellows. In Mexico, more and more birds weave cigarette butts into their nests, thus diminishing vermin that threatens the health of their chicks. Only two examples of a new ecology that governing politicians and biology teachers likewise would most definitely abhor. No space is innocent – but so what? We live in Post-Tchernobyl and Post-Fukushima times. There is no turning back to the supposed pureness and innocence of a pacified Garden of Eden. But dealing with urban ecologies might be a real chance for new concepts of conviviality and resistance in surprising places: stubborn grandmas feeding pigeons as a form of public militant mass defiance, for instance. Where there are cities, there are pigeons. And where there are pigeons, there is resistance! Fahim Amir is a philosopher and cultural scientist, working at the intersections of nature, cultures and colonial historicities, transcultural agency and urbanism. He is currently teaching at the Department of Experimental Design of the University of Art and Industrial Design Linz. Amir was curator of Live Art Festival 2013 »Zoo3ooo: Occupy Species« (Kampnagel, Hamburg) and »Salon Klimbim: Feeding Vegetarian Tigers – Entertaining Utopian Sensibilities« (Secession Vienna, 2014). Amir co-edited »Transcultural Modernisms« (Sternberg Press, 2013) and recently provided the afterword to theGerman translation of Donna Haraways »Companion Species Manifesto« (Merve, 2016).